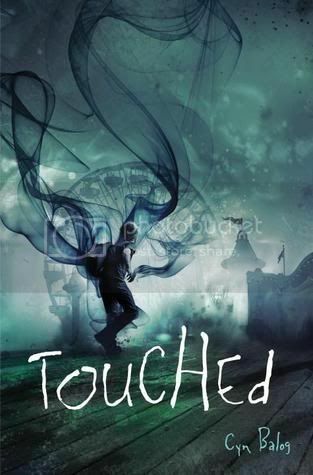 Touched is the first book that I have read from author Cyn Balog, and I found the book to be a very quick, enjoyable read! I am really looking forward to reading more books by this author. The main character in the story is Nick Cross. Nick has a rare ability that allows him to see his future. His life plays out as a script that he must follow, or else the path for his future will change forever. One slip up in the script, like saving one girl instead of another, will change Nick’s life in more ways than he expected. The story is told from Nick’s point of view, which I enjoyed because I really haven’t read a lot of books from a guy’s perspective. Also, with Nick, he’s far from perfect. He’s clumsy and quite introverted, which I think is why I connected with him so well. The people in his town called him a freak, and he thought he was a freak as well because of his ability. You have to feel sorry for the poor guy. I was so glad to see Taryn come into his life. She was definitely good for him. The secondary characters we well written as well, and I would have to say one of my favorites was his Nan. She was a remarkable character that loved Nick more than anything. She made me think of my grandfather in that aspect. The storyline for the book is very addictive and mysterious as well. I had no idea what was going to happen as I moved along in the story, but I just HAD to keep reading to see what would happen. The book has tons of twist and turns right up until the end that will keep you flying through the pages. I love that this book is a stand-alone novel, there’s definitely lots of closure at the end. Overall, I really enjoyed this book, so much more than I expected to. It was just the read I needed to read at the moment. I can’t wait to read more from this author! I haven't read any books by Cyn Balog, but this one sounds great. I love a good, hard to figure out mystery. I'm reading this now - I'm glad to hear there's lots of closure! Great review! Ooh, I love when you just HAVE to keep reading to find out what happens. There's nothing like the feeling of diving into a book like that! Sounds very intriguing. I haven't read any books yet by Cyn Balog but she has been on my list of authors to try for ages. I love the cover! This is the first I've heard of this book and it looks really intriguing. I'm especially intrigued by the cover. Kind of reminds me of the dementors in Harry Potter. I haven't read a Cyn Balog book either, but I'm really intrigued to try this one out. Great review! This definitely sounds interesting. I always keep an eye out for books with male MCs, because I enjoy reading from their perspective sometimes. Well written secondary characters? Yes please! Great, great review, Christy. You've really got me curious and excited for this one. This is new for me :) Thanks for the review! You make this sound really awesome, which makes me reconsider whether to add it to my to-read list or not... I was definitely intrigued by its summary, but I wasn't really sure whether I'd like to read it or not. But that seems to change now. Thanks for sharing!